The “Plug and Play” design Fireset™ Horizontal Split Case (HSC) allows easy installation. Armstrong’s Fireset™ HSC 5x4x17F and 6x5x12F pumps could be used for installations that require between 500 and 1,000 USgpm. 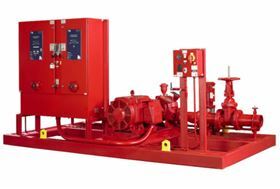 Compatible with both electric motor (50 Hz and 60 Hz) and diesel engines, the Fireset™ HSC pumps have a double suction design for efficient performance. The pumps have a suction and discharge alignment; balanced and fully enclosed impeller; factory-aligned pump and motor; protective bearing-removal mechanism; and removable upper-half casings. The suction and discharge are on the same centre line to allow sprinkler contractors to do re-piping in the pump room before the pump arrives. The electric-driven pumps can have right or left hand suction configuration. They also have a compact design for easier installation in tight spaces. The Armstrong line of Fireset™ HSC Pumps offers a performance range of 500 USgpm to 3,000 USgpm.